This is the finished piece from the sketch in my last post. I photo copied the sketch, tore out the face and applied it to canvas paper. I added color with watercolor pencils. Her hair is paper napkins and other collage elements are some of my crochet and tatting. 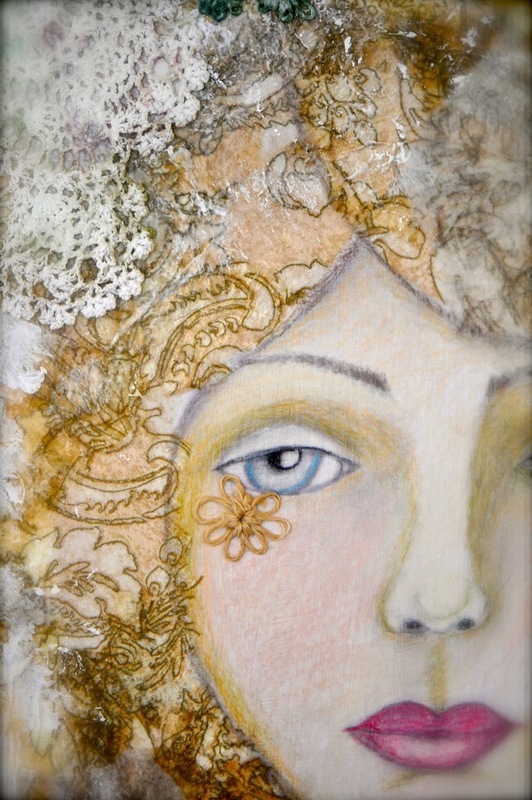 do stop by and see some of the other artful inspiration. Oh My Stars.. she is gorgeous. You did such an amazing job on this. I love the textures the hair has and how you added your little crochet and tatted creations.. LOVE IT!!! So very beautiful Becca! Wow.. she is incredible! Wow this piece is gorgeous. Great colors, textures... everything is beautiful. Super job!! how unique and stunning this is!! Truly beautiful...I have wanted to try something like this ever since I saw a canvas my friend had commissioned of a floral piece but I'm not a flower person. Faces I can do but I've never worked out where to start with collage. Think I may just have to dive in and have a go! You've inspired me! Wonderfully done. It's just a great piece of art work. Congratulations. Wow! A stunning piece of art! So lovely Becca! You create things that are unbelievable, just so beautiful. Wish you a nice Sunday and new week. Greeting Torunn. Ooo Becca she is absolutely glorious!! She looks so serene and lovely but the details that surround her are really beautiful. A gorgeous picture. I love how your brought all your art media together Becca! Fantastic!! Wishing you a wonderful beautiful Sunday my friend! Oh my gosh Becca, this is fabulous. I love everything about it...the colors, textures, her expression and how you used your tatting in the work! Simply elegant and lovely work! What a creation! I am so glad you snapped some macros of the hair and surroundings....wow!! Beautiful! I'm so glad you showed the close up detail shots. This is amazing...just beautiful. She is magical. I love the teardrop. You are very creative, great piece. Becca, that's stunning! Looks like a self portrait. I wouldn't worry about the symetrical face, this is just so uniquely your style. Love all the bits and pieces you've used! This art reminds me so much of Stevie Nick's art work. Have you seen any of her pieces?? You would love her paintings. You have the same technique as her!!! Check her out. I have a friend who can draw and copied a piece of hers for me. Becca! This is fan.tas.tic!!! Wow! You are such an amazing artist! This piece is totally luscious. I love your color pallet and her face. Adding fiber makes art more special. You are truly amazing my Friend! The layering of crochet and color is soft, beautiful and rich in texture...so lovely. 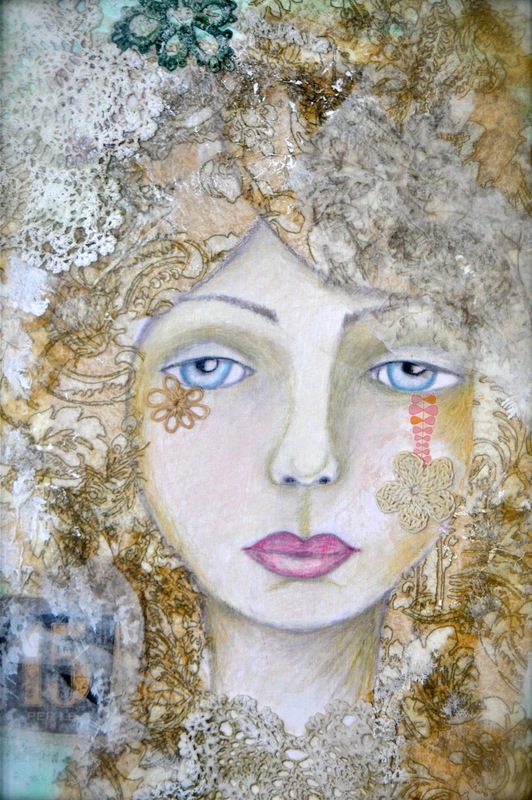 I really love all the mixed media elements you used in this piece, Becca...so lovely! such an awesome idea using the crochet and papers collage.....you have totally inspired me!! !